What happened to the first Peugeot was that I got sick of driving it around Burque with the husk of that damned old rattler painted up with paisleys of different sizes, designs, and graphic intricacy. I reckoned someone might take me for a hippie; the Dancing Bears window sticker sure as hell did not help. So one summer, I let the 504 set in the front yard and rot. First the fuel pump got leaky; then the belts began to fray. The back tires leaked. I had to pump them up every day at the Chevron on the corner of Girard and Central if I wanted to drive around. I used to like to sit on the front porch after work watching all of that decay transpire, drinking out of a brown bottle of Coor's Banquet beer, waving to the neighbors and spitting tobacco juice onto the lawn while fine folks gamboled past mi chante. It was a hot summer with lots of rain. By the end of July, it seemed like that world I just told you about gathered itself up into a complex geometric shape and moved to another, distant location. Some folks I knew actually disappeared forever. But I stuck around, all the while acting like nothing at all was wrong. In August I sold the car to a scrap yard because the university only paid once a month. I needed groceries, beer and oil paint. 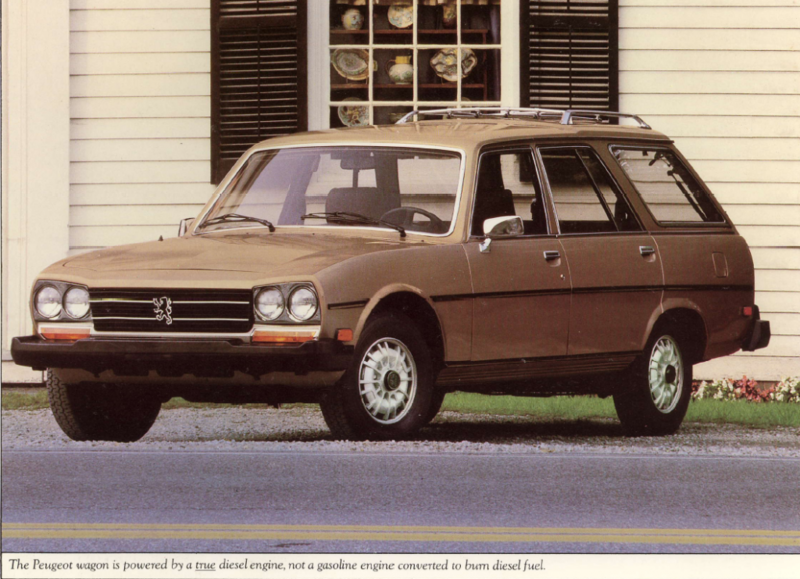 I was real glad to be part of the magic trick that made the first Peugeot disappear. I thought the car was cursed. Two close encounters with the Raton Pass in winter during practically identical blizzards had scared me off as a pilot. The first time I stopped half way up the mountain to put chains on the back end. Three nanoseconds after I climbed back into the driver's seat, a truck with flaming wheels roared by and rolled off the cliff. I smashed two fingers in the door on account of speedy reaction timing. A year later and I had to swerve around a giant pine tree that had come down upon the road. I'll be damned if I didn't restore control, but it was all frantic activity with the back end bucking and swaying with an evil inclination toward the edge, the snow falling like heavy white ashes. Before I got a hold of the first Peugeot, my brother wrecked the transmission while chasing an evil black bird down San Mateo Boulevard. I ended up buying the 504 from a pal of his, a fellow who worked at the watermelon processing plant. The freak-stained paint job was a whole different deal. I let a gal I was dating do the work. She had an army of stencils; she listened to the Cure and the Bolshoi. She had enough spray paint in her studio to tag every inch of every concrete arroyo in this burg. She told me she loved me. When you are twenty four years old that sounds pretty damn good, even when you have a hunch it's not going to last forever and all you'll end up with is a car done up like it is still nineteen-sixty-seven. I walked back and forth or skated to work after the Peugeot was gone. It was just fine because summer. Sometimes I'd get moody about that automobile and the story that went with it. When that feeling came, I'd stop by Hidden Park for a quick cheer. Over yonder, you could see me loping around the place like a thin ape with big piano-playing hands. I was speaking tenderly to the birds and field mice, swishing my Vans high tops around in the long grass as I proceeded, waving and singing towards home.